Some of the questions showing up in my inbox lately have to do with Coloris, DMC’s new multi-colored stranded cotton. 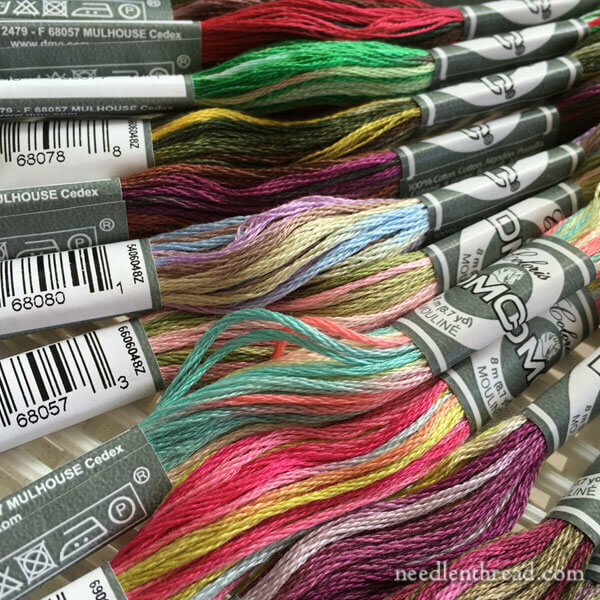 In the meantime, I’ll answer a couple questions about the thread that may help you decide if you want to add this new collection of twenty-four colors to your stitchy stuff. Let me put it this way – if you have a fun streak when it comes to embroidery, I’m pretty sure you’re going to want to add it to your stash! First of all, the very basic question: what is it? Coloris is a mercerized stranded cotton, just like DMC’s regular stranded cotton. It’s the same base thread. It’s made up of six strands that can be separated and used individually for very fine work, or used two, three, four, five, or six strands at a time, depending on how heavy you want your stitching to be. The difference, of course, is all in the color. 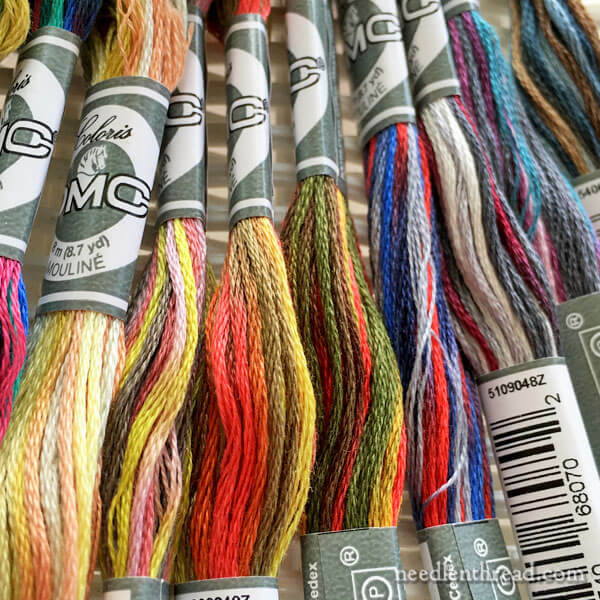 Coloris is a multi-colored thread. Each skein is pretty much packed with color! And while the colors in each skein are compatible, they don’t necessarily belong to the same or similar color families. They are complimentary colors, and they involve some vivid contrasts. How does Coloris differ from Color Variations? Color Variations is DMC’s more familiar line of “overdyed” threads. Each skein combines shades (in a soft and gradually changing sequence with no noticeable harsh contrasts) from the same or neighboring color families. 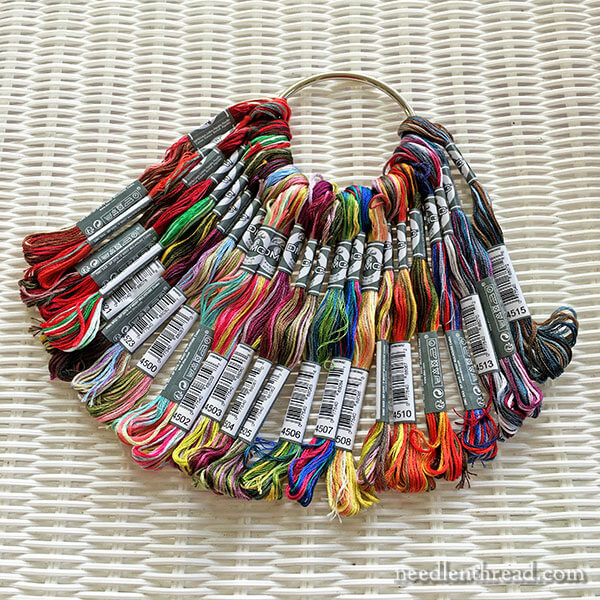 The colors change gradually – you’re into a new color about every four inches of thread. The colors blend blend smoothly and seamlessly. Coloris is the wild-and-slightly-hyper cousin of Color Variations. The colors within each skein change more frequently – about every 1.9 inches – and the colors that make up a skein don’t promise a lack of contrast! You’ll find contrasting colors working together for a dramatic, motley effect. You might call Color Variations soft, elegant, gentle and calm. Coloris you might call bold, vigorous… and a bit crazy. Coloris fills a gap in the cotton embroidery thread line by supplying a variegated thread that changes colors more frequently and that employs vivid contrasting colors within the individual skeins, for a more dramatic and noticeable effect when stitched. Like other variegated threads, you can manipulate Coloris to do interesting things with color, within the constraints of the colors offered in each skein. We’ll look at this concept later, when I share some stitched samples with you. In the meantime, the advantages of Coloris are the same advantages you’ll find in DMC stranded cotton: it is easy to stitch with, it is colorfast and fade resistant, and the colors and their sequences are consistent from skein to skein. Check with your local needlework shop! If they carry DMC, chances are, they have Coloris in stock. I haven’t checked any of the hobby and craft stores that carry DMC to see if they have Coloris in stock, but I would imagine most stores that carry DMC will eventually carry the collection. I have not seen this in the store yet. It looks like a lot of fun! I’ll keep my eyes open now. Thanks, Mary! I have been an avid thread collector and DMC is the thread I use the most. I just finished my second set of dish towels (not very exciting compared to most of the work here, but great for me) These threads are fun to stick in here and there to add some variation and something new in the way of colors. I have washed one set of towels and the thread does indeed appear to be colorfast as DMC threads have always been. However a warning, slightly off topic the red DMC thread I had used ran and made a mess of those towels I used it in. I have never had this happen with DMC threads and wonder if this is a one off since the thread is several (a lot)years old. With some baking soda, spray and wash and cold water it came out mostly, but just a word of caution. What beautiful colours. Colouris by DMC look lovely and what I like is the colours are so different from each other and yet combine together lovely I like the wild and the dramatic it suits my nature. I can’t wait to see the project and photos of what you have done with these threads it’s so exciting. Thank you so much for sharing with us Colouris thread. I wonder where you can buy it in the UK, I shall have to investigate. I hope you are well. I have seen it online at sewandso.co.uk. RMW – I understand what you are saying but there is another way to look at that shipping fee. I sell on line myself, but I also buy a lot on line and every year it becomes more an more as I am disabled with really bad arthritis and it is so hard to get out and go shopping. They closed my nearest fabric store, years ago and so now to get anything ‘crafty’ it is around a 42 mile round trip which is about 1 1/2 gallons of gas which today would run about $4.00 just for the gas, not to count the wear and tear on the car and if you are one of those that when you are out end up eating out as well you have that extra expense. Just wanted to give you a way to justify paying a shipping fee if you wanted one. I do agree though that if you are in the US $5 is a bit much for shipping 3 skeins of floss, but these days it does run around $3 to ship a small padded envelope. I too love varigated threads and have all my life. Even when I was much younger (I’m 60 now) I used to think that there had to be a better way of doing varigating, instead of going from white to navy blue and back, white to bright red and back, white to dark green and back, etc. Now we are living in a glorious age for those that love varigated threads. Funny but my husband doesn’t like the looks of them. I just wish I had the energy and co-operating hands to do more hand embroidery. Crazy Annies Stitchin and Stuff website on Bonanza carries the Coloris. Have you tried 123stitch.com? Their shipping rates are pretty reasonable. It would be about $2.00 for three skeins of floss but since they are selling floss at a rather nice discount, it is as if one is just buying retail anyway. They also have really, really good customer service! Mary those are very interesting threads but I too would love to see what you are doing with them. Even a little peek would help. I ordered the set from Commonthreads along with extra floss holders (which are larger than the regular ones) and that brought me up to the free shipping amount. I did a little freehand sample….some cross stitches and french knots. Then I labeled each with a micron pen. This way I know what is what and what the colors look like. I wanted this primarily for french knot flower centers or flowers. Also I wanted the greens for leaves. The regular varigated threads didn’t change color often enough to see much difference in a leaf or flower. Now that I know which ones I like for flowers and leaves I’ll try some lazy daisy petals with french knot centers. I’m pleased with this line and can’t wait to see what your project is. Do you know if DMC has released the component colors of each of the Coloris threads? I couldn’t find it on the web site. I was thinking these would be a good accent for something that was mainly monochromatic and knowing the base colors would be helpful. I look forward to seeing your stitched samples, Mary. This thread is so sassy! Hope you are feeling well and doing better. Janie Hubble of Cat’s Whiskers used to synchronize the variegated floss so that as the floss was stitched the colors would change but the change could be less noticeable. Have you tried to synchronize the DMC Coloris floss? Thank you for the long awaited review of this floss. Hi Mary, went to my local Joann’s today to see if they have the DMC Coloris. Just wanted to let you know that they do not have it-yet. Will keep checking back to see if and when they do. Darn it Mary – you are SUCH an enabler! Now I want to play with these amazing threads too – roll on lottery win!!!! Wow, what kind of fun is this? I can’t wait to get my hands on some of these threads. I have used variegated threads in the past, but they were usually the same color running from light to dark. The exception was a ‘rainbow’ thread. I have been doing hand embroidery since I was a child. dollar I will not be buy again until our dollar rises. I did buy before the drop. I got a couple of courses which I might say are terrific. I was unfortunately unable to get another of these in the last days as I had been trying to ask a question at Craftsy re where to get the beads used in particular cuffs. So the dollar dropped and I couldn’t find the beads so I take it that I was not meant to have it. I know that is a lot of cods wallop but anyway I missed out, so it is now to finish the UFIs until all is calm. I really think getting these deals has been fabulous. Even not going to a class and seeing the instructor/tutor is really not necessary as they are there and we are able to ask questions or show an tell and have our teacher comment. Biggest help it teaches us to be patient and we are not the only ones in the class. Like you I am at the moment finishing off my Hazel B’s Late Harvest. Believe me 2 of Trish Burr’s. Other stuff as well. I am sitting here this morning finishing a Louis XVI chair repair, seat and back. Unfortunately the threads had to be dyed with natural dyes used in the era. Not always an easy task. I find it all enjoyable. Cold weather I don’t. I hope all in northern climes are enjoying their summer. In my small town, unfortunately, the only place to buy any kind of sewing notions is Walmart. I’ve not specifically checked there yet for Coloris, but I did an initial search on Amazon, and was shocked to discover single skeins being sold for over $5! Are they that expensive in the stores? What is the average price for a skein that you’ve found? Hi, Krystyna – No, they’re not that expensive in the stores! You can find the skeins available individually through some needlework shops. All the colors are currently available individually on Commonthread (DMC’s website / blog), and they run around $1.55 a skein. ///// one way and then \\\\\ the other way? Or should I do XXXXX? Does my stupidly-written question make any sense? Will anyone see this, or am I just screaming into the void? Hi, Carl – welllllll, I think it depends on the look you want. But I understand your questions perfectly. If you want all the colors to bunch together in little groups of color, then stitch xxxxxx but if you want them to sort of blend and speckle and change a little, then stitch ///// then \\\\\. You might test it both ways to see how you like it. I think you’d get an interesting effect, either way – but I suppose it somewhat depends on what colors are crossing over if you go the /// \\\ route.